For my first card today, I used the new Spooky Sweets stamp set to create a colourful watercolour scene perfect for Halloween! I created my watercolour panel first with purples, blues and greens. Once I was done the watercolour, I added flicks of white paint over the whole panel and then I set it aside to dry. While it was drying, I cut, scored and folded a Grout Gray card base and stamped it with the new Triple Stripe Background stamp with Grout Gray ink for a tone on tone look. I love the subtle detail it adds to the background of the card. Once the panel was dry, I stamped on the sentiment and the bats with black ink and then I adhered the panel to a Black Licorice cardstock mat and then added it to the card base. I diecut the circle shape twice from white cardstock and trimmed down one of the circles with the Stitched Snowdrifts Die-namics to create the grass area. I used an ink blending tool and Distress Inks and added colour to both of the pieces before adhering them together. 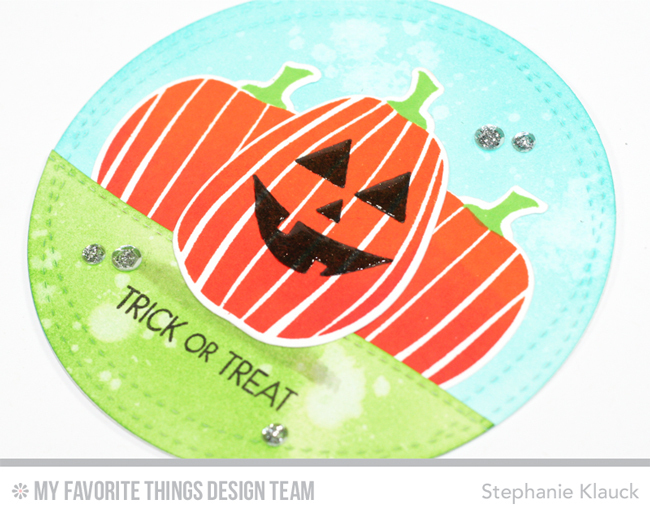 I stamped and diecut the pumpkin images from the Spooky Sweets stamp set and adhered them directly onto the card front. I stamped a face on the front pumpkin and I covered it with Glossy Accents for a shiny look. To finish the card I stamped the sentiment in the grass area underneath the pumpkins and then I added some clear sequins for some added dimension. Thanks so much for joining me for day 5 of the August release countdown. All of the new products that we're sharing all week will officially be available in the MFT online store at 10pm EST on August 2, 2016. Awesome background on your first card. It really makes the bats stand out. Love the watercolor background on the first. And the second card is just too cute! Very cool first card and very cute second card. I love your beautiful background and the tone on tone stripe. Shaped cards are fun. You always create the cutest projects! So exciting!! 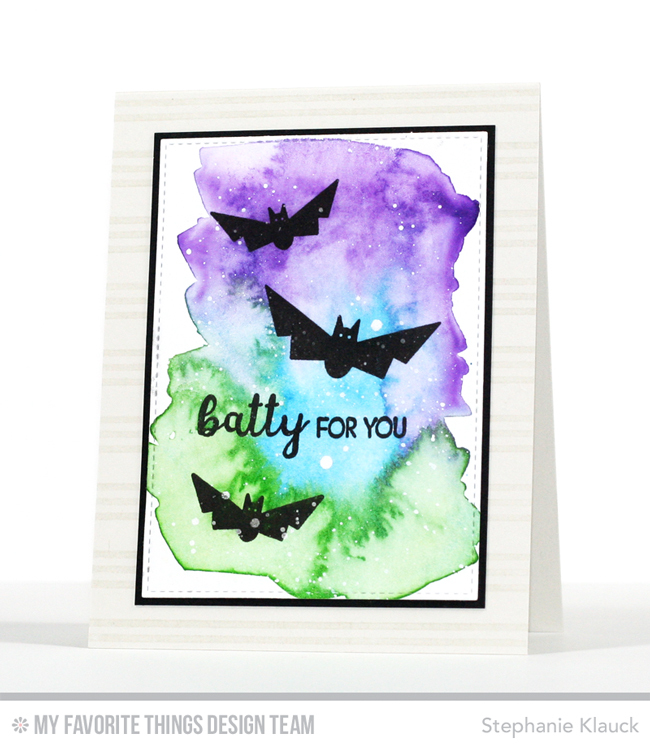 I am batty about your awe inspiring bat card- yes the triple stripes do set the scene! The pumpkin card is so cool being round and having one jack-o-lantern set off by two pumpkins! I love the background stripes - a very cute card! 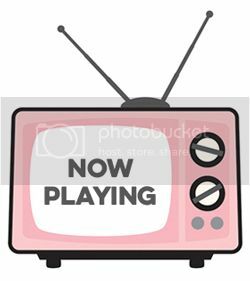 What a great background choice. Love the background in the first card and the second card is just so cute. 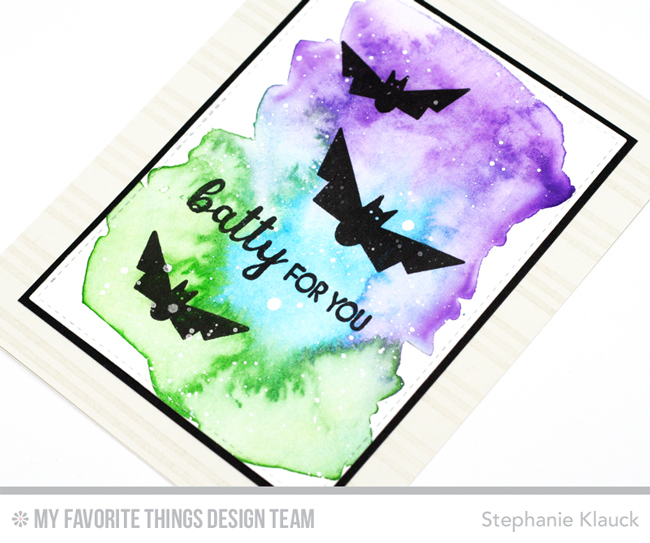 The water color background on the batty card is very interesting. Did you cut it before you water colored it or afterwards. I like the irregular shape of it. Great messy watercolor background. Thanks for sharing your ideas with us. Awesome watercolor background on the first card. And AWESOME round card! Very clever! I love watercolor, and your first card is the best! Halloween Greetings are perfect fit for these Stamps. I love the bold & bright colors for the bat card. 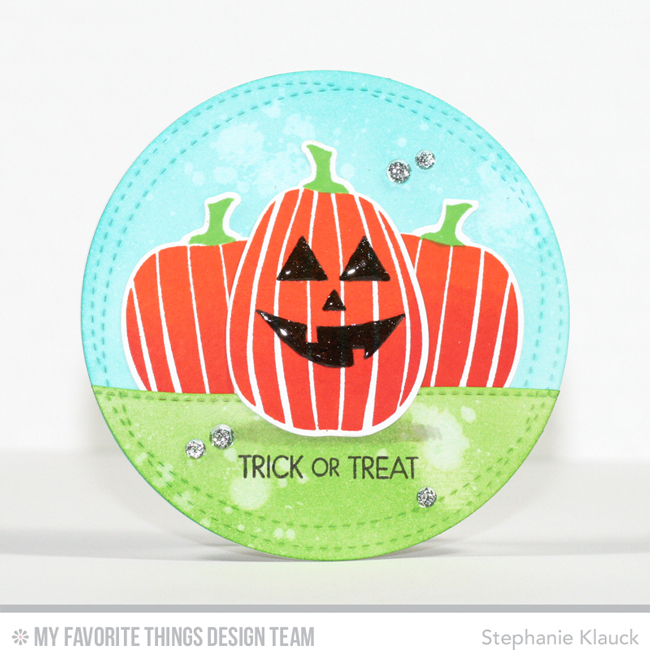 The circle shape is perfect for the pumpkin stamps!